Giving to Charity is a Win-Win. Businesses, Governments, and People like us Can't Affort NOT to Give to the Poor. Effective altruism is a movement that's revolutionising the way we give to the poor. Peter Singer described it as "one that combines both the heart and the head." The heart empathising with and wanting help the less well off; the head ensuring our efforts to do so went the furthest. That's where the concept of effectiveness comes in. A hundred dollars given to a Guide Dogs foundation will pay for less than 2 days of training (Guide Dogs Foundation, Australia, 2014); that same hundred dollars could provide a reliable source of clean water to 300 people in Sierra Leone (World Vision, 2014). That's not to say guide dogs aren't a worthy cause; but individuals, charities, businesses and governments have begun to realise that the world's most deprived regions are where we can cause the greatest change, and that by directing a majority of our funds there, we'll create the greatest change. But though our heads are starting to temper the way these funds are directed, it's the heart that we target to gain those funds in the first place. And it's the second concept of the movement, altruism, that describes most of our efforts to help thus far. At its core, altruism encapsulates the very essence of humanity; our ability to care for wellbeing of others and the act of putting their interests above our own is an anomaly of survival of the fittest arguably unique to our species. But the very words 'charity' and 'aid' exude connotations of personal sacrifice, and the fact that only 5 of 22 OECD countries give the agreed upon 0.7% of GNI towards Official Developmental Assitance (OECD, 2012), and a 40% drop occurred in private flows to charities from 2007-2008 due to the GFC (World Bank 2009) shows that that sacrifice, especially in the face of adversity, is often deemed too much; the reward of a warm, fuzzy feeling too little to justify the expense. But what if the rationality of the mind, which so often gives us excuses not to give, could be used to justify giving more? What if we viewing charity beyond the strict confines of altruism; what is we saw charity as a win-win? Well, in many cases, charity is already just that. Though it seems counterintuitive at first, there are already many ways governments, corporations and individuals benefit themselves fiscally, as well as morally, by helping those less fortunate than themselves. The rise of the concept of Corporate Social Responsibility in the 1950s signalled a change in the ideals of businesses as they recognised their success was intimately entwined with a satisfied, thriving population. Since then, the benefits of engaging in charitable behaviour on increased productivity and moral capital have become well documented. Businesses, large and small, that allowed employees days off to volunteer for instance, saw dramatic increases in workforce morale and productivity (Smith 1994; Points of Light Foundation, 2005) and thus concepts such as "volunteering days" or "community leaves" were born. Similarly, larger corporations; particularly those in disputatious industries, that engaged in strategic corporate philanthropy generated moral capital that mitigated the severity of sanctions and unfavourable press against the firm when bad acts occurred (Fombrum 1996; Jackson 2007; Godfrey, 2005). This benefit of giving is great, but CSR has to grow beyond just a way of patching up the mistakes companies have made, and with the growing disgruntlement of the wider public to corporate irresponsibility leading to wide backlashes, indeed, they can't afford not to engage in more generous acts. Brand image is of vital importance to a company's success, and acts of charity have excelled beyond that of maintain ethical practices and adherence to codes and guidelines; they've become a marketing tool. A wide-ranging survey found that 89% of consumers are likely to switch brands similar in price or quality for such a cause (Cone Communications 2014). And strategic charitable initiatives taken by companies, those initiatives in line with their core values, benefit not only the recipients, but also the companies who organise them. Monsanto partners with many governments in the third world to reduce world hunger through programs such as Project Share, which provides farmers in India with education, tools, and their superior genetically modified seed (Monsanto, 2014). This allows farmers to make the vital jump from sustenance to commercial farming, gaining them not only free publicity through press coverage; restoring Monsanto's widely denigrated image of a greedy, "GMO producing (and therefore evil)" corporation, but also creating farmers who will go on to become future customers themselves. This is but one example showing how acts of kindness by businesses often turn out to be wise investments. 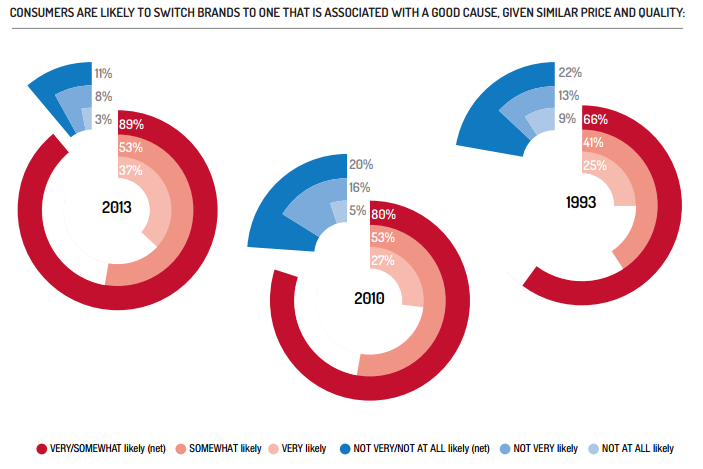 Over the years, consumers have become more and more willing to switch brands for companies that give more. Cause related marketing, and the charity-business partnerships that are born of it, have proven to increase the effectiveness and impact of money given by corporations by reducing the reduce the costs of setting up while also significantly improving brand image, as it associates the brand's values with the charity's own (Porter and Kramer 2002). The Red Revolution, where companies such as Nikon and Starbux donate 10-50% of profits of product-lines with red labels to the Global AIDS Fund, allow consumers to make an impact in their day-to-day lives while helping the company sell more product. This movement is extremely effective, as it reduces the cost required to set up individual programs, and the benefit to a brand that participates in this program is two-fold. Not only are they improving brand image, they're also getting a more distinguishable, preferred product on the shelf. Positive brand image not only to increased sales in the short term, but also garners businesses highly desired brand loyalty. Potential customers are more likely to buy products from companies that care, not just once, but over and over again (van de Brink et al, 2006; Hsieh A, Li C, 2007). The concept of microfinance, which achieves staggeringly low default rates of less than 1% consistently (Grameen Bank, 2013; Field and Pande, 2008); a lower risk than a mortgage in the developed world, is further proof that the gratitude of charity pays off directly. Those who benefit directly from the company's aid programs, as well as those in wider society who appreciate their values, are more likely to be loyal customers of that brand. The power of the gratitude of those alleviated from poverty seen in the microfinance industry brings to the fore another, less widely acknowledged idea. That the alleviation of the burdens of poverty results in increased consumerism and the development and the growth of emerging markets in addition to better quality of life. And transnational corporations, particularly those from services and technology industries, are already benefiting from this growth. The surge of the middle class in China and India is living proof of this concept. Sony forecasted a tripling of phone sales in China alone over 1 year , and Cisco System's is already providing nearly 40million homes in India with our equivalent of cable ], and as of 2009, GM sold more cars in China than it did in the US (Ernst and Young 2014), highlighting the gains that can be made by pushing more of the world's poorest into the middle classes. The benefits to the poor countries are clear and staggering to say the least; every 10% increase in the number of people earning between $10-100 a day corresponds to a 0.5% rise in growth (Bhalla 2007), and the number of people in that bracket is set to double to 3billion by 2030 (Ernst and Young 2014). Imagine how much companies and the world's poorest stand to gain by accelerating this growth further, and by establishing themselves and their brands early in the developing world through charity. Though the benefits to both are clear, it can be argued that the profits from human development take time and great investment to be realised. But even now, the world's poorest are holding markets that corporations and businesses are targeting. Microsoft researchers published a paper on how to increase the efficacy of mobile phone sales in Mumbai's slums (Rangaswamy & Nair, 2010), showing even the world's least-well-off are beginning to access technology. Taking away their biggest obstacles; basic sanitation, employment, housing and attainment of education, is not only the cheapest, most effective way to help them; it's also helping us too. Governments are in a unique position of having both the political and financial power that charities and businesses lack, which is why they're responsible for 80-85% of developmental aid that breaks down these barriers (OECD, 2014). Developed nations' governments and their people tend to own and dominate the technology, research and services sectors which stand to gain the most from the development of the world's poorest. Thus, despite popular opinion otherwise, it is indeed in their best interests to foster this development. The bypassing of pharmaceutical patents by many developing countries which represents a loss of nearly 3 billion potential customers is a perfect example of the hazards of the festering global inequality. Yet the aid budgets of many countries in the Development Assistance Committee have decreased, as lower than expected economic growth during periods of austerity calling for the reduction of "unnecessary spending" (OECD, 2012). It could be argued though that the growth of markets are long term, non specific benefits of aid, and that governments who give too much at their citizens' expense are irresponsible. But official developmental assistance (ODA) already shows palpable benefits to nations in the short term. Multilateral aid in particular cuts down the likelihood of international conflicts and provides a very effective, collaborative way of dealing with crisis situations. But bilateral aid, which comprises the 70% of ODA (OECD 2014), often directly benefits the giving nation through the concept of aid-in-kind. Tied-aid programs, which attach assistance to the fulfilment of certain trade or policy concessions, are often criticised for being less effective, predatory as they're designed to mainly generate income for the donating nation, or for addressing human rights violations while ignoring the larger issue of global poverty (GAO 2009; Younas, 2008; Pfutze T, 2008; Younas, 2008). But this trend is changing, with developed countries increasingly utilising the cheap labour and locally-sourced, cheaper goods of developing nations while providing what them with what they don't have; technology and expertise. Australia's contribution to the Small Hydro power Scheme in Remote Fijian villages is a perfect example of this. Villagers were allowed access to electricity for the first time, gaining them the ability to store food and for children to study at night, while hydro-electric companies and engineers from Australia gained contracts, stimulating economic activity in Australia's while also gaining the nation valuable expertise (Liu et al, 2013). And indeed, the very engineers who participated in that program went on to help design the Snowy Mountain Hydroelectric Scheme, which provides Australia's largest state with 10% of its electricity usage and invaluable irrigation to this day. But if charity is already such a no-brainer; why isn't more of it happening? How do we make the benefits clearer, in order to get it happening more? The lack of evidence for the benefits of giving is part of the answer. Though there are numerous studies linking Corporate Social Responsibility to improved financial performance (Margolis and Waslh 2001; Griffin and Mahon, 1997) , little evidence exists quantifying those benefits (Vaidyanthan, 2008). Some suggest the lack of consistent theory behind the benefits of giving are to blame (Margolis and Walsh 2003; Smith 1994), others that the methodology and sample sizes aren't consistent or reliable enough (Griffin and Mahon 1997; Porter and Kramer, 2006). But whatever the reason, it's impossible to justify charity as an investment to shareholders and voters when you can't put a dollar figure to it. Securing this data will cause change, but it's only part of the answer. The development and emergence of markets due to human development, the concept of customer and recipient loyalty leading to profits, the improvement of brand image and international relationships can't, or aren't even being measured as benefits of giving to this day. Thus, a paradigm shift, along with increased investment, into how we view and study aid is required to get reliable data on the benefits of giving. This data will make giving something businesses and governments can't afford NOT to do. Perhaps people simply aren't aware that giving can be mutually beneficial. The semantics of giving and the sacrifice it's associated with are in part to blame for this, but lack of awareness of both the efforts companies already go to for others, and the society-wide benefits of giving are part of it too. The Red Revolution discussed previously is backed by large corporations such as Coca-Cola, Starbucks and Apple; yet most reading this wouldn't have even know it existed. I know I hadn't before I wrote this. If companies were to actively advertise their efforts to help others more, not only would they benefit themselves through increased sales and business (and put the onus on others to match them, thus causing a chain effect that will increase the private sector's contribution to charitable causes), they'd also achieve another goal. Making the public aware that giving can be a win-win. Charities are beginning to realise this too and are opening the eyes of the public to the idea that charity needn't be something that comes at their expense through giving people more interactive, more fun ways of giving. The UNICEF-Tap-App, in partnership with Georgio Armani, is a perfect example of this. The app is helping thousands kick their smart-phone addictions for the wonders of real life by giving them compelling motivation to do so; the donation of a day's worth of water for every 10 minutes users spent off their phone. Smaller organisations, such as the Louis26 Foundation, dedicated to helping cancer patients and their families through tough times, organise parties, get-togethers and sporting events, with all proceeds going to charity, allowing people to enjoy some respite from their daily lives without the guilt of self-indulgence (Louis Segregato 26 Foundation, 2014). MaterHomes runs lotteries with statistically higher chances of winning per dollar spent; satisfying both the innate fascination and desire of a decadent, luxurious life and the more accomplishable, gratifying goal of helping others simultaneously. And microfinance organisations, such as Kiva, are increasingly allowing users the option to withdraw money if they wish to attracting not only altruistic donors, but also those looking for a reliable way to save. It could be argued that this mentality of benefiting yourself while helping others corrupts the very ideals of giving. That it would create a business minded approach to charity that would compromise that which we already gave to the more needy. But that allegation assumes that people currently give only to gratify themselves, or because society deems that they should. The heart is the core of altruism. And our compassion, and willingness to help others will not diminish as long as inequality exists in this world. The power of humanity will not be smothered by perceiving charity as a win-win; it will be unleashed, as it unfetters the concept from the chains of sacrifice that binds it. If people were to realise that charity is a win-win, then people and the governments and businesses which exist to serve them would be more able and willing to help others. Something that all humans are programmed to do, deep inside. If businesses and governments, who control and regulate the entire world's resources finally came to the realisation that the developing world has the most people, and stands to be the largest markets in the future; if they finally saw that they'd secure their prosperity by investing in, rather than holding back their potential, then charity wouldn't just be a great investment, but one they can't afford NOT to do. If we could expand the scope of global development from the spare change in ones' pocket to the entire bank's own interests, if we could bring the $100trillion world economy to realise that growth need not come from the subjugation of others but rather the advancement of us all... we will finally cure poverty. This was a longer version of an essay competition entry I wrote for Bill Gates. Have a read of it and tell me what you think! Also let me know any other ways you can benefit yourself by giving to charity (I'll be expanding on this and adding chunks to it over time, and showing more ways of how you can benefit by giving to others - and I'll give you a mention for any idea I add in there!) Also - let me know what you think! Points of Light Foundation and the Center for Corporate Citizenship at Boston College. 2005. "Measuring Employee Volunteer Programs: The Human Resources Model. " P. Godfrey, “The Relationship between Corporate Philanthropy and Shareholder Wealth: A Risk Management Perspective.” Academy of Management Review 30(4):777-798. Porter, M. and Kramer, M. 2002. “The Competitive Advantage of Corporate Philanthropy.” Harvard Business Review 80(12):57-68. Bhalla S 2007, ' Second Among Equals: The Middle Class Kingdoms of India and China" Comparative Economic Studies 09/2011; 53(3):355-381. OECD (2014), "Development aid: Net official development assistance (ODA)", Development: Key Tables from OECD, OECD 2014, No. 1. Margolis, J and J. Walsh, (2001) "People and profits? The search for a link between a company’s social and financial performance." Mahwah, NJ: Erlbaum. Griffin, J. J. and J. F. Mahon, (1997) “The Corporate Social Performance and Corporate Financial Performance Debate: Twenty-five Years of Incomparable Research.” Business and Society 36, 5–31. Margolis, J. and J. Walsh, (2003). “Misery Loves Companies: Rethinking Social Initiatives by Business.” Administrative Sciences Quarterly 48: 268-305.